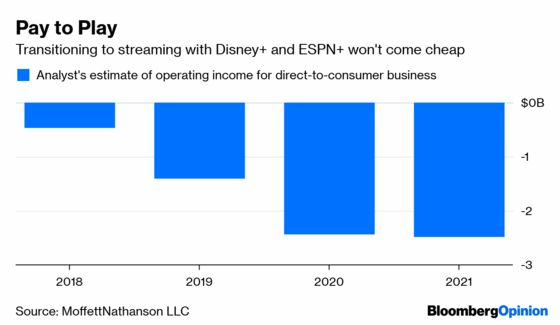 (Bloomberg Opinion) -- In order for Disney to get to “Disney-plus,” it’s going to have to be Disney-minus for a while. On Wednesday, Walt Disney Co. will officially complete its acquisition of 21st Century Fox Inc.’s film and TV-entertainment assets for about $85 billion, including debt. The deal expands Disney’s library of content as it looks to become a major competitor to Netflix Inc. in online-video streaming. Next in this process comes the April 11 big reveal of Disney-plus, stylized as Disney+, the name of its new subscription streaming app that will be available to consumers at the end of the year. While both these moves may be advantageous to Disney in the long run, earnings during the next few years will likely reflect significant disruptions to a company that shareholders appreciate for its stable nature and predictability. There may be meaningful losses in the new direct-to-consumer streaming business, reduced licensing revenue for Disney’s other divisions and disturbances to its unique corporate culture. Disney is also issuing some stock to Fox investors, which will reduce earnings per share. So, for the first time in a long time, Disney’s quarterly results could be a bit tumultuous and hard to interpret. The short-term pain may be better than the status quo. Shares of AMC Networks Inc., Discovery Inc. and Viacom Inc. all dropped last week because channels they own were cut from AT&T’s DirecTV Now streaming service. AT&T’s move to raise prices, prune content and sacrifice subscriber numbers in an effort to preserve profits may be emblematic of the broader thinking among cable operators and other video-service providers. That will drive more viewers to cut the cord. With Disney+, the company is trying to control its own destiny. Developing a streaming product is extremely costly. 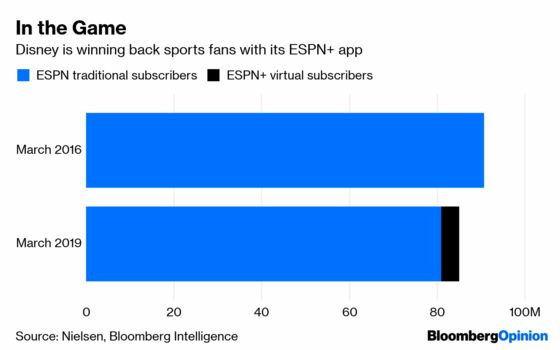 The company is forecasting that losses for the direct-to-consumer streaming unit worsen by $200 million in the current quarter versus a year earlier, most of which is due to the costs of marketing and content for its ESPN+ app that launched in 2018. 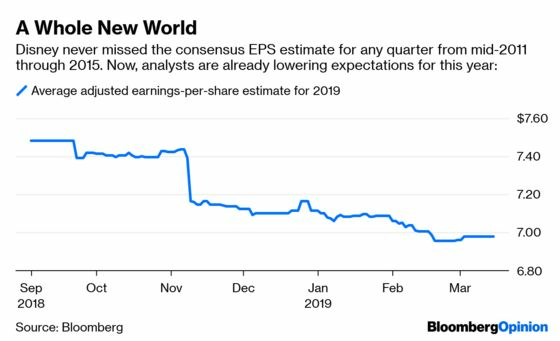 As it builds and then launches Disney+, the unit may lose $1.4 billion in total this year and more than $2 billion in each of the next two years, according to Michael Nathanson, an analyst for MoffettNathanson LLC. Alan Gould of Loop Capital Markets LLC pegs the loss at more than $3 billion by 2022. Buying Fox also increases Disney’s stake in Hulu to 60 percent. Hulu is growing, but loses money as well. The hit to licensing revenue starts with “Captain Marvel,” the first feature film Disney is withholding from Netflix to preserve for its own app. Disney said this will reduce operating profit for its media-networks and studio businesses by just $150 million in fiscal 2019. That said, it has some other big movies coming out later in the year, including “Avengers: Endgame,” “The Lion King” and “Frozen 2,” for which the pain of forgone licensing revenue will be felt more strongly in 2020. The goal is to fill out the Disney+ offering so that enough people sign up. Not long after, Disney introduced a little-noticed streaming product in the U.K. called DisneyLife that served as the testing ground for what would later become a full-fledged streaming strategy. Publicly, Disney was happily working with Netflix, while quietly planning its attack. Its experience with DisneyLife and the technological hiccups that came with it led to the important acquisition of BAMTech, which would later power ESPN+ and Disney+. Fox will test Iger’s patience, and Disney+ will test investors’ patience. But as I wrote recently, Iger is more than getting compensated for the trouble. He also hasn’t given shareholders a reason to doubt him yet.